The average age of all the wineries in Elgin is just five years. “It just isn’t logical to think that we should have found our niche by now,” says Paul Cluver. “We’re an incredibly young region and to a certain extent, we are still finding our way.” There is indeed lots of experimentation, with Syrah the latest ‘buzz’, though the early examples of Pinot Noir impressed me greatly too. The region enjoys not only a cooler climate, but a variety of slopes, hills and aspects. Iona Estate is run by Andrew Gunn, an ex-engineer who did a lot of climate measuring on his farm, before realising the surprisingly cool conditions meant Sauvignon Blanc was the obvious variety to claim as his trump card. Paul Cluver’s family have farmed here for over 100 years. They focus on five varietals, Sauvignon, Chardonnay, Riesling, Gewürztraminer and Pinot Noir. Oak Valley is run by the genial Anthony Rawbone-Vijoen. His only complaint? A big contract to supply the Swedish monopoly has limited his ability to supply his lovely Pinot Noir to other markets. Belfield is one of the newer names, where Mike Kreft planted only red wine grapes on a small, north facing site in 2002. Rigorous canopy management aims to expose his Cabernet Sauvignon, Cabernet Franc, Merlot and Shiraz bunches to maximum sun. Highlands Road was established only in 2004 on a former fruit farm by British couple Justin & Mary Hoy. They are following a passion and a dream to make Sauvignon Blanc. The final and newest member of this little tasting group is Almenkerk, owned and run by Joris and Natalie Almenkerk. 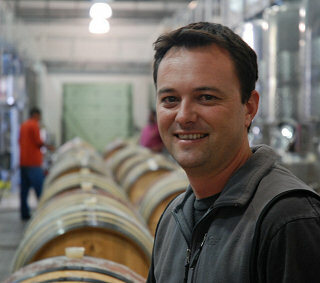 Joris, a Belgian lawyer, moved to the Cape in 2002 and the estate is the realisation of yet another winemaking dream. Quite a tropical fruit nose, but delicate and complex, little pea shoot notes. Lovely fruit on the palate, though seems quite sweet, with a slightly disjointed feeling in the finish. I think this would be better a touch drier, but very fine and delicate. 86/100. Not in UK as of May 2010. High pyrozene levels here, and Justin says he is looking for longevity in the wines. Only a couple of thousand cases. Mineral, lemon-balm notes, with a touch of green bean coming through. Much more sour lemony fruit, much more primary at this stage, but lean and citrusy and very focused. 89/100. Delicately, soft, leafy herb fruit. Gooseberry and a touch of apple, even peach coming through over citrus. Lovely thrust and minerality, terrific vivacity here, but dry, mineral, pithy and citric and tight. 91/100. See all stockists on wine-searcher. Aged in 40% new French oak and barrel fermented. Plenty of oak on the nose, with a figgy green bean richness and a nutty apple fruit, just a little glimpse of mango ripeness. The palate has a luscious ripeness, but staying juicy, with a blast of tangerine fruit and fine acidity. Very nice wine this, of lovely balance. 90/100. UK Agents are Great Western Wines and Thierry’s. See all stockists on wine-searcher. Fine Gewurz aromatics, with gentle gooseberry and lychee aromas, And a touch of smoky minerality. Lovely palate too, with a big grapefruity blast of fruit, tangerine orange and plenty of acidity playing against the little sweetness of the finish. Lovely balance. £8.99, Waitrose. See all stockists on wine-searcher. This has 11% alcohol and 198g/l of sugar. Beautifully delicate lemon glycerine nose, all sorts of delicate tea leaf and even orange blossom notes and the gentlest toast. This has shimmering acidity that is also soft and juicy, there’s a touch of lemon zest too, but it is that lovely tangerine and lime fruit that runs through the palate. Beautiful and a delightful, light-bodied style. 92/100. Cold maceration for a week. Highly spiced, incense-like nose, beautifully floral fruit. Lots of kirsch and cherry, with a coffeeish background of oak. A touch dry on the palate perhaps, but with a lovely smoky, sweet earth quality and delightful cherry red fruit. Fine tannins, and though this is a touch chunky and spicy, and might be better with oak and alcohol reigned back a touch, it is a lovely wine. 89-90/100. Planting more Pinot noir at 10,000 vines per hectare. Very authentic Pinot nose, with an earthiness and woodland note, and some nicely autumnal berry fruit. The palate has a lovely rhubarb and beetrooty style, sweet fruited with the earthiness and gentle vegetal quality. Lovely edge to this wine, and a really fresh style, acid and quite tight tannins giving cut and structure. 92/100. Little touch of tomato, leafiness and cherry red fruit. There’s a layer of vanilla, and a certain mineral character too. The palate has lovely fruit sweetness, a bold cherry and red plum juiciness, with a nicely roughening tannin quality. Quite creamy and ripe tannins, but they do add some structure along with sour cherry acidity. 89/100. Lovely cab nose, a touch of earthy quality, a touch of herbal too, but the black fruit has lovely roundness and a fleshy, supple mid-palate with a fine balance in the finish. Very juicy and tannins and acids nicely integrated. 90/100. Intense purple colour. Beautiful lift to the nose, with a real sense of minerality and tight, glossy, but tightly wound black fruit. Lovely cool climate Syrah. Palate has dry tannins, but I think this is a wine to cellar, as the fruit is composed and tight, with chocolate and dark, plum-skin bittersweetness. Long and stylish this, but quite a serious wine. 92/100. There’s a very suave and sophisticated feel about the Morgenster experience, with its olive oil tastings and classical music playing. But then its owner is Giulio Bertrand from Piedmont, and one of its Directors and consultant is Pierre Lurton of Cheval Blanc, so perhaps that should come as no surprise. Pierre Lurton comes each year for the blending, and samples are sent back and forward throughout the process, but from day to day winemaker Henry Kotze (right) is in charge, worked previously at Vergelegen from 1999 to 2001. I stopped by the stunning manor house in the grounds in which Mr Bertrand lives, and he told me how he had bought the manor as a home originally, but then decided to plant olives and vines. Around 25 hectares of vines are now planted, comprising Bordeaux varieties plus Sangiovese and Nebbiolo. Many varieties of olive were imported from Italy too. As we walk through the vineyards, Henry tells me that fighting Leaf-roll virus continues to be a major battle: the disease is transferred by insects, blown in the wind, and carried from farm to farm on people’s shoes. The rocky, weathered Shale soils found on the farm are free-draining and suitable for the big red varieties grown, and the simple but immaculate cellar bristles with stainless steel and high-quality French oak barrels. 90% Sangiovese, with Bordeaux varietals. Delicately herbal, lightly raspberry aromas. Sweet, stewed red fruits and tea notes, and a lovely, light, sweet cherry and berry fruit. Nice soft tannins and an elegant, dry finish with lemony acidity playing against the sweetness. 87/100. 65R at cellar door. A blend of 60% Sangiovese, with 20% each of Merlot and Cabernet Sauvignon. Smoky, tobacco leaf note. Lots of fragrant cedar and Sandalwood and a soft, plumy fruit quality. Touch of vanilla and cherry fruit. The palate is super sweet and ripe on the palate. Plush, soft berry fruits flood the mouth. There is quite high acidity giving this an edge, and then the smokiness of the wood comes through adding toast and spice, maybe feeling just a touch hot in the finish knocking off a point or two. 90/100. 220R cellar door. 70% Merlot with Cabernets Sauvignon and franc. Very fudge-like, soft and smoky nose, with a sheen of pencil shaving over elegant black fruit. Particularly silky red fruit, with a real sweetness to the mid-palate fruit, with ripe tannins and tasting very youthful. It has fine balance, with good acidity and soft tannins melding with the structured but sweet and silky fruit. 92/100. Thirds of the three Bordeaux grapes. Delightful nose, filled with sweet, rich berries and that silky overlay of cedar and fragrant cedarwood spice. The palate has more weight than the 2005 at this stage, with a real creaminess, but that same sweet, pure, focused red berry fruit marrying to a bit of cassis decisiveness. Lovely tannins here, very polished and chocolaty. Fine balance, and at 13.5% alcohol naturally better balanced. 94/100. Guardian Peak began life as a second label to Rust en Vrede according to Marketing manager Kobie Lochner, and it was intended to broaden out Rust en Vrede’s reputation from the ‘connoisseur bracket’. It was also an outlet for experimentation, like the Shiraz/Mourvèdre/Grenache blend which was one of South Africa’s first, and their rather good Tannat/Malbec blend. Since being spun-off as a label in its own right, the Guardian Peak facility in Somerset West has become and extremely popular lunch spot with its fine dining restaurant on a terrace overlooking the vineyards and mountains, where only Guardian Peak wines are sold. The concept is an interesting one, as you first choose what wine or wines you wish to drink, and then you are offered a choice of dishes to go with the wine. Gently peachy and orangy, appley, fruit salad. A pleasant, slightly off-dry style with fresh acidity. 84/100. Cabernet Sauvignon pink. Generic, slightly sherbetty, green apple sharpness. Lacking in flavour and slightly too acidic. 82/100. A blend of 60% Tannat, 30% Malbec and 10% Merlot, this spends 18 months in all French oak. Big, plush and creamy. A touch of cedar. The palate is robust and sweet-fruited, with a nice finish, the tannins grippy in a well-balanced wine. 88/100. Eighteen months in new French oak. Name is word play on Napa Valley, also meaning ‘a meeting place’. Huge, sweet, plush nose with copious cassis and cherry. Delicious sweet and sour, glossy black cherry fruit. Plush tannins, and quite long finish. A very plush style but very well made. 90/100. Certainly South Africa’s most uniquely sited wine estate, Cape Point Vineyards only neighbour on the Cape Peninsula is the State Park that runs all the way down to Cape Point itself. Sited on the slopes of the famous Chapman’s Peak, vines have been grown here for centuries, but it was extensive re-planting by owner Sybrand van der Spuy in 1996 that established the modern day operation. This is a particularly cool area in viticultural terms, where a really hot day might hit 30ºC, whilst the thermometers in Stellenbosch are reading 40ºC. 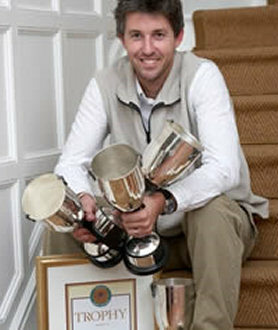 That has made Cape Point a leading exponent of Sauvignon Blanc, and their wines have subsequently been garnered with top scores and five-star awards from John Platter and others. Winemaker is a suitably Sauvignon-obsessed young Afrikaner called Duncan Savage (right), who spent four months working with Didier Dagueneau in the Loire and left with a determination to make not only top quality Sauvignon Blanc, but a profound expression of the grape. Despite extensive travels through the best Sauvignon areas of France, Australia and New Zealand, Duncan says “I don’t believe in working vintages overseas, because any monkey can clean a press or pump some wine. It’s much more important to just spend some time with the great producers, trying to understand what makes them tick.” He certainly has a unique terroir to work with – the only producer on the Cape peninsula – and is pushing the envelope with his barrel-fermented, Graves-style Isliedh cuvée. Nice lime peel note, a touch of sherbet, not overtly herbaceous. The palate has a clear, juicy acidity with ripe but crisp gooseberry fruit and lemony acidity. 86/100. All Cape Point fruit. Some herbaceous, but gently asparagus notes, more passionfruit and very ripe pear notes. The palate has lovely succulence with a juicy, lemony acidity. That grassy punch pushes through, keeping this lean and focused without being strident. 88/100. Barrel fermented in 600 litre French oak, this is a single vineyard Sauvignon Blanc blend with a 18% Semillon. Very gently waxy and toasty, little seed notes. Lovely Sauvignon character. There are tiny floral nuances and lots of green herb nuances. The palate has lovely waxy lime leaf and lemon fruit, with constrained, restrained concentration. 91/100. Big, bold, burnished orange notes are dramatic, with the waxy lemon fruitiness beneath and a smoky, almost mineral touch to Sauvignon’s more punchy herbaceousness. The palate hints at greater ripeness than the 2008, with lovely acids keeping it subtle and composed. A lovely style for the future. 92-93/100. Comes from two areas of sandstone and granite, which bring different properties to the wine. A touch of honey over piercing green apple fruit, fine fruitiness and freshness. 88/100. UK Agent is Alliance Wines. See all stockists on wine-searcher. Big, rich, vegetal nose from 40-year old vineyards. 20% barrel and lees contact. A touch of fennel on the nose too. The palate has a cashew softness with a real minerality that comes through. There’s a terrific zestiness and a real mandarin orange brightness too. Delicious. 91/100. From bush vines, spends four months in older barrels. 10% Botrytis on the Chenin. Lovely note of honey here, with a gentle nuttiness, a slightly more oxidised style. The palate has texture and weight and a lovely fat, juicy, peachy mid-palate before very good acidity. 89/100. Beautifully ripe, rich, quince-like and fig with a fabulously sweet, ripe nose. Low yielding fruit from a bush vine vineyard that is over flown to draw infrared maps showing leaf cover hot and cold spots, and find the specific vines that have identical leaf cover, which allows them to pick specific vines with identical canopy values and therefore identical fruit. These are picked together and there are six tries. All fermented in French oak for 12 months, with natural yeast and some barrels Botrytis affected (usually around 2% of blend). Fantastic palate, just overflowing with delicious, honeyed, nectarine fruit. 93/100.